This year, our son, Landen is all about basketball. Last summer, he really took an interest in it and is still loving everything about it today. 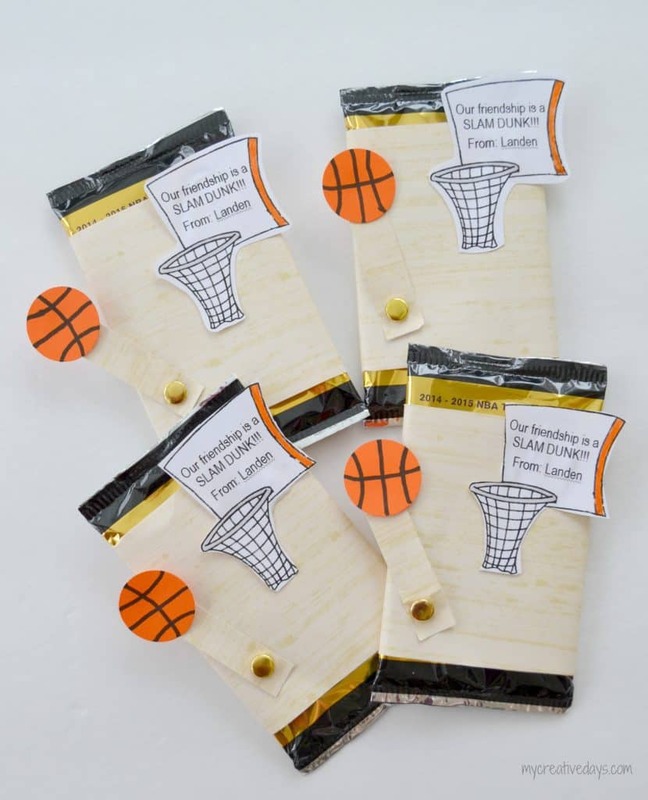 So, it was only fitting that we came up with a way to create basketball valentines to hand out to his classmates during his Valentine’s Day party at school. The first thing we did was punch 1″ circles from the orange paper. 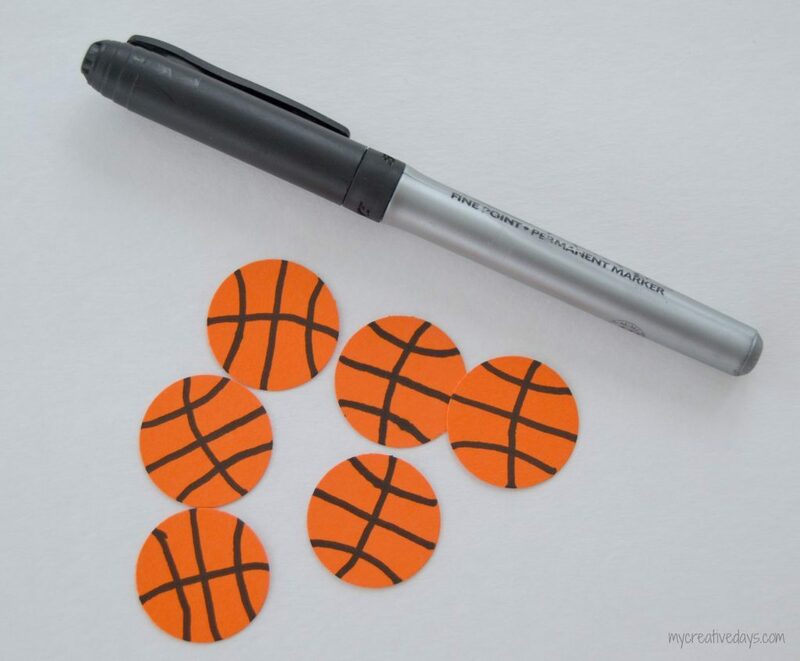 Then, we used a black marker to draw the lines of a basketball on them. 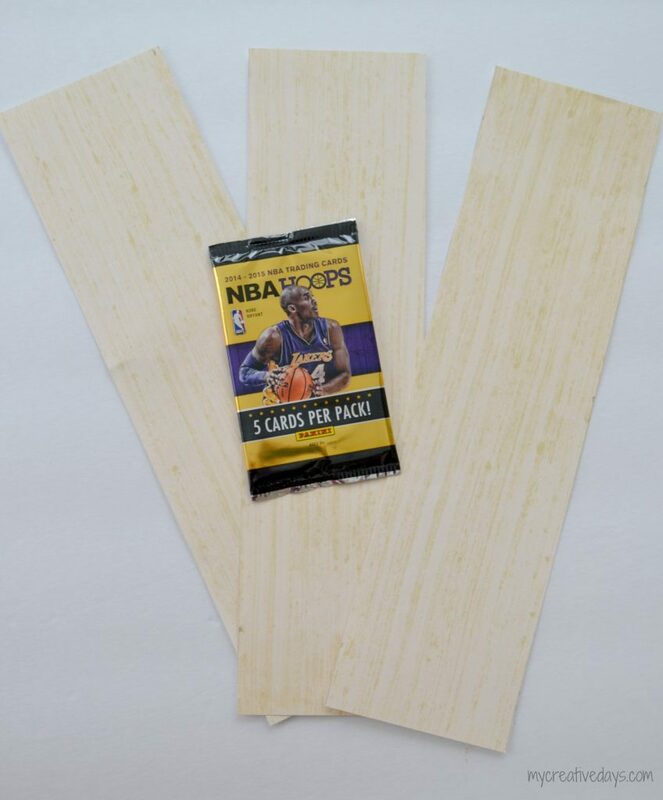 Next, we cut 3 1/4″ strips from the wood grain scrapbook paper to wrap around the packages of basketball cards. 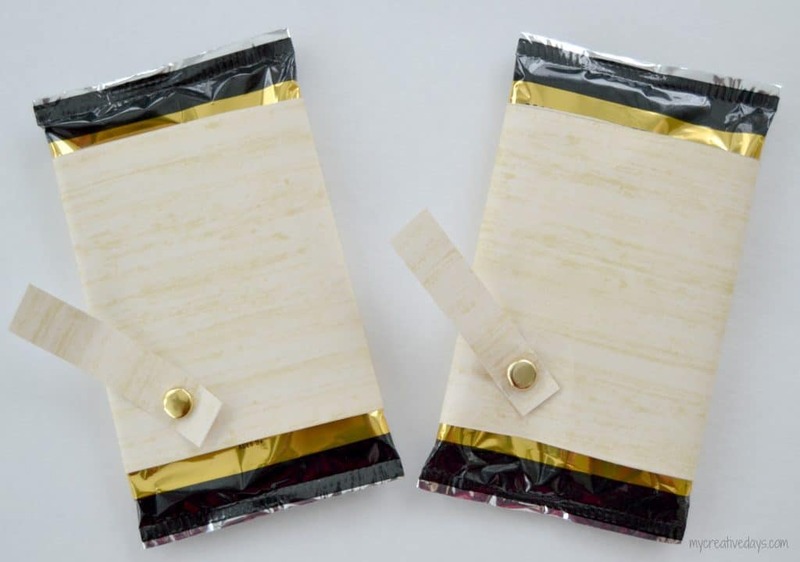 We were able to wrap two packages per strip. We wrapped the package of cards with the paper and taped it shut to make a “sleeve” around the cards. We removed the cards from that sleeve to add the “arm” to it. The “arm” is going to hold the basketball on one end and be attached to the sleeve on the other. Since there is a brad on it, it was too hard to get the brad closed when the cards were still in the sleeve. 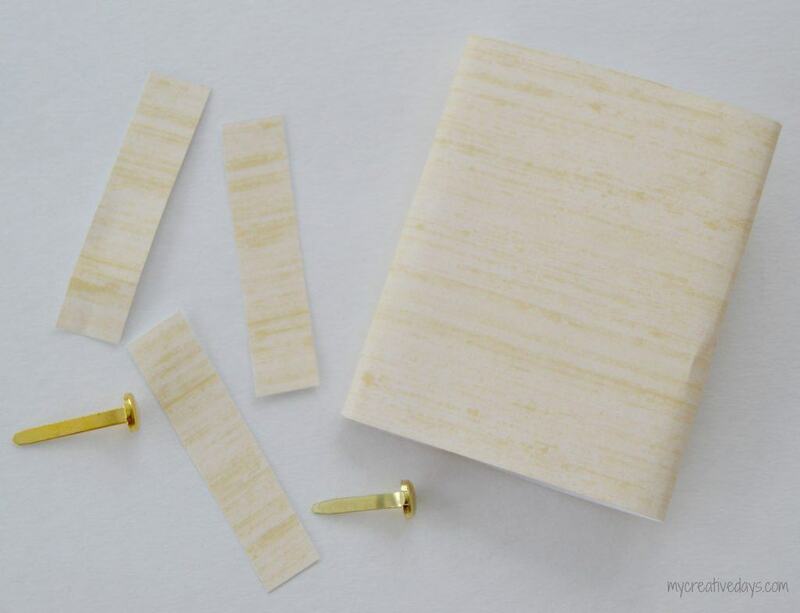 To make the arm, we just cut small strips from the leftover scrapbook paper and added a brad to one end. Then, we put that brad through the sleeve towards the bottom (see picture below). Then, we put the card packs back in the sleeve. Next, we glued the basketball to the other end of the arm and glued the hoop to the sleeve. 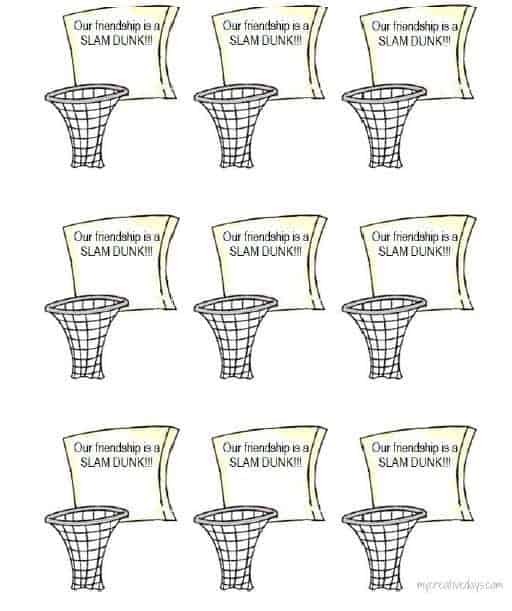 For the hoop, I used a clip art picture and typed the words, “Our friendship is a SLAM DUNK!! !” on the back board. You can DOWNLOAD YOURS HERE! 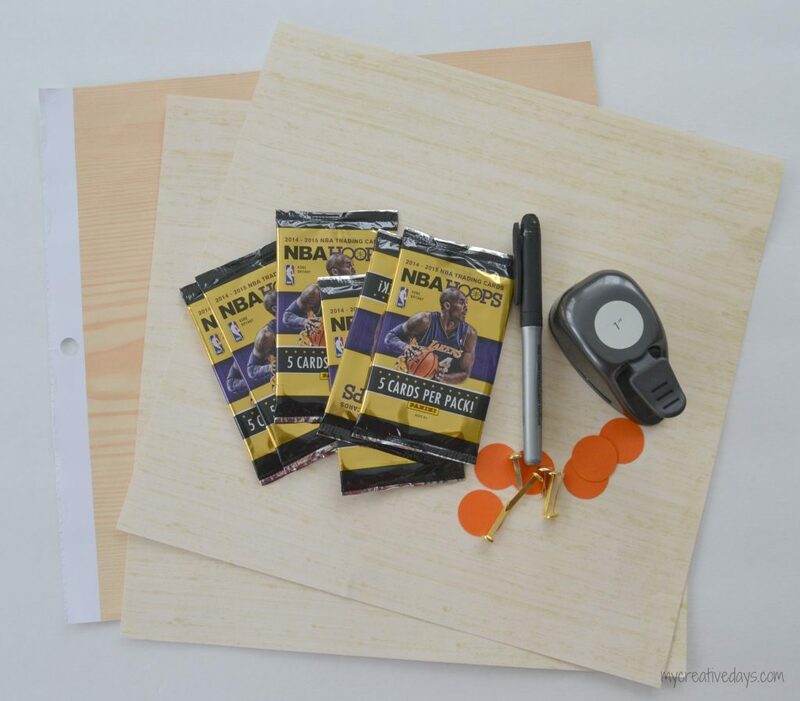 The brad makes it so the kids can “SLAM DUNK” the basketball into the hoop! These would be great for a basketball themed birthday party too. You could add the party details to the sleeve or even make them for take-home gifts or thank you notes at the end of the party. What kind of valentines are your kiddos handing out this year? I love these! 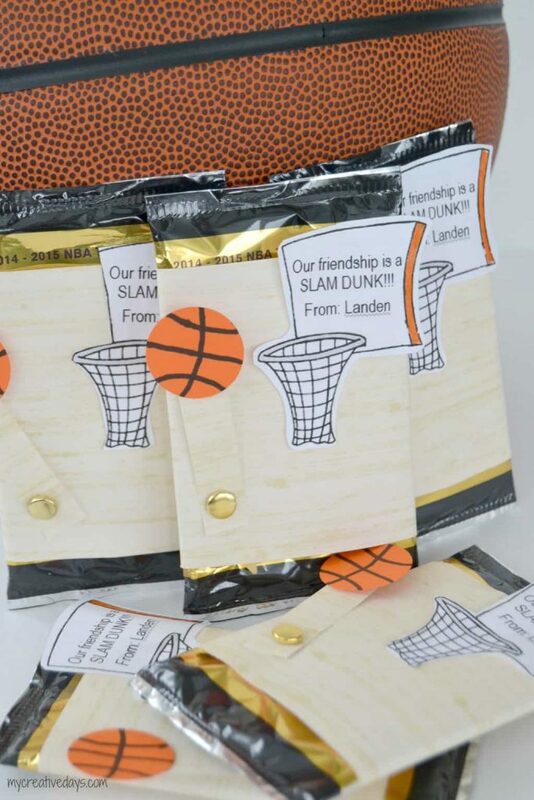 And what are the odds that my son wants basketball valentines this year and his name is also Landen!! Thanks for the idea! That is hilarious! My Landen is all about basketball right now!